Over the past several years, we have been working hard to come up with the best LED trailer lighting options in the market, and to get these at the best possible price for the quality. 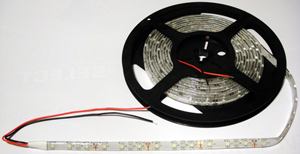 We offer a full line of gasket type and surface mount LEDs in red, amber, and white/clear colors. If you look at our trailer LEDs, they are all made with safety and quality first. ALL our trailer LED lights are both SAE and DOT approved. Make sure you compare apples for apples- the lights need the DOT approval to be installed legally on a trailer that travels on a public roadway. We have the brightest LEDs, widest dispersion angles, standard industry connectors, and water tight enclosures to ensure the best, most problem free trailer lights in the business. If you are interested in purchasing on line, just click on "MORE INFO" on the desired product below and use our secure shopping cart to make your purchase fast & efficient! 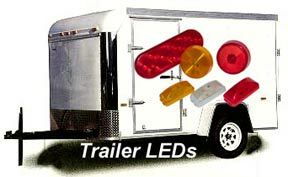 We have newly added a full line of clear lens trailer LEDs in various color LED diodes to make your trailer lighting stylish and very modern. Clear plastic lens with colored LEDs give a unique look. Available in both surface and gasket mounting styles. 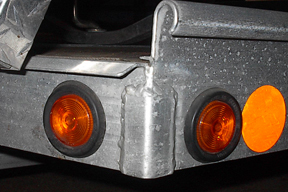 Most all trailer lights are sealed, non-bulb replacable units. These are most commonly mounted with a black rubber gasket and sometimes with a metal trim ring. If you have a trailer, from a small open trailer, to a large enclosed trailer, to a commercial over-the-road 48 foot semi trailer, we have a Hi-quality LED replacement. It will be the last light you need for your trailer. For Replacement lights that mount with fastners to the surface of a trailer, we have a line of the most popular surface mount LEDs now available. If you scroll thru the pictures, choose any LED that looks like yours and the detailed display window will help with the exact size and dimentions. Most all surface mount LEDs are available in either red or amber and are SAE and DOT approved. Some are available in a white/clear LED option for an additional price. Small oval (approx. 4"x2") Surface mount LED lights have LEDs and removable lens for mounting. Available in Red and Amber. X-Treme Tape is the Original self-fusing silicone insulating & repair wrap. A must for all powersports applications! Instant fix while on the road. Originally developed for U.S. Military applications, X-Treme Tape has been tested and proven in the most extreme conditions and environments. It is the most versatile and easy-to-use quik-fix emergency rescue repair tape available. X-Treme Tape withstands extremes in temperature, pressure, voltage, moisture, corrosion and contaminants. 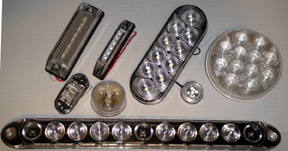 We have added a line of frequestly requested maintainance and repair items for replacing lights on trailers. We have several mounting gaskets for installation of sealed lights, mounting bases for surface mount marker lights, and pigtail wire harness for 2 & 3 wire connectors. All are very reasonably priced to help with your needs. Prices are for one unit, or per each. Our new Aluminium bracket is designed to make adding a oval trailer light a snap. Aluminium construction so it is light weight and will not rust. Pre drilled mounting holes to simplify installation. Any of our 6" oval LED trailer LEDs and a rubber gasket fit right into this bracket. 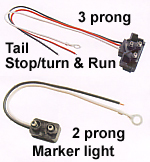 Wire connectors: We are also carring replacement trailer light connectors for 3 prong (taillight) and 2 prong (marker light) lights. The connectors have bullet connectors and molded rubber plug. 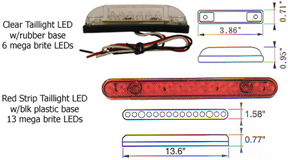 Our LED in-line Flasher module is also listed in this category. Works with any amount of LED lights to provide a flasher.